The mystery of the whereabouts of the real Green Hornet, Britt Reid, continues in this issue, while the new incarnation of the emerald-clad warrior, Mulan Hayashi, foils a robbery in the opening scene. 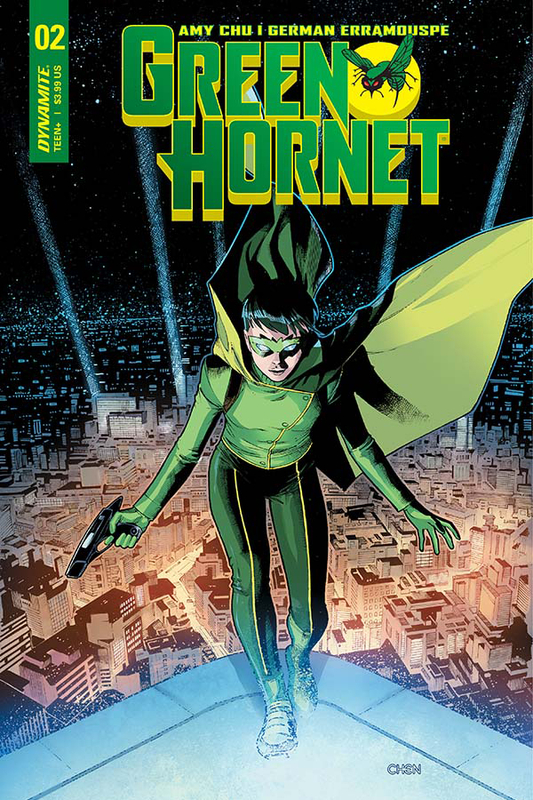 Word soon spreads of the Green Hornet’s return, but Mulan and her colleague are soon tasked by Britt’s father to do whatever they can to find him. We’re introduced to a new character, Sebastion Cabot, an old friend of Britt’s who happened to be celebrating his birthday party in Istanbul. Britt was last seen at that party, and both Mulan and Tai find themselves on a plane to Istanbul to track down Britt, only for all hell to break loose and for the mystery to deepen even further. Revelations about the role of a celebrity secret society are made, with the clear impression that the circumstances of Britt’s disappearance are sinister indeed. If that wasn’t enough to engage the reader, Sebastian is quickly dispatched, making the sense of danger all the more pressing. The art overall is good and dynamic, very much in the same vein as the last issue. The intrigue and suspense are well set up here, and the reader is quite invested in the whereabouts of the original Green Hornet. We are presented with an excellent cliffhanger, paving the way for what should be a great issue number three. So far, this series is riding high on very good momentum, and there’s no reason why the reader shouldn’t stick around to see what’s next.